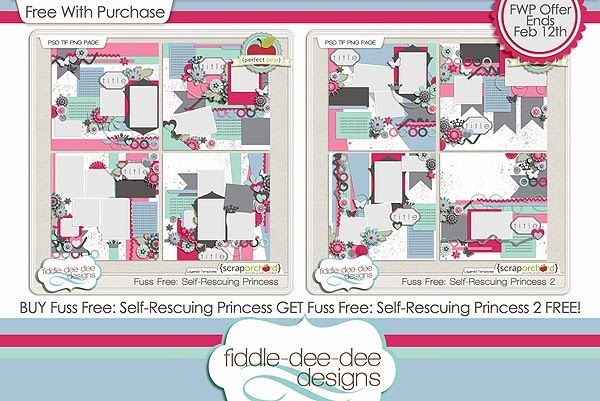 Fiddle-Dee-Dee Designs: New & FWP ~ Fuss Free: Self-Rescuing Princess 1 & 2 Collab with Bella Gypsy! New & FWP ~ Fuss Free: Self-Rescuing Princess 1 & 2 Collab with Bella Gypsy! Not all princesses need rescuing! We can take care of our own selves, thank you very much! Fuss Free: Self-Rescuing Princess and Fuss Free: Self-Rescuing Princess 2 templates are ideal for a variety of self-exploration layouts, not to mention if you have a sassy little princess in your life, these templates are perfect for you! Be sure to check out the coordinating kit and journal cards from Bella Gypsy Designs! Purchase Fuss Free: Self-Rescuing Princess and receive Fuss Free: Self-Rescuing Princess 2 FREE! Offer valid through February 12, 2014. The February Template Challenge has been posted at My Scrapbook Art and you can download this free template for your stash. Be sure to check out all the inspiring example layouts while you are there! Also, the February Exclusive Template for my Facebook Fans is available on my Facebook Fan Page. Once you get to my Fan Page, make sure you have "liked" the page and then click on the EXCLUSIVE GIFT FOR FANS thumbnail under the cover image. You will be able to download this beautiful template from there. I'll have a free template for you each month in one of the Scrap Orchard Weekly Buzz newsletters. Make sure you are subscribed so you don't miss out on these templates that available exclusively to Scrap Orchard newsletter subscribers! Also, be on the lookout for my final freebee template for the month of February ~ it will be posted on the Scrap Orchard Blog on February 11, 2014, as part of Template Tuesday! Join me Wednesday, February 12, 2014, at 10 pm EST for another Scrappy Hour! 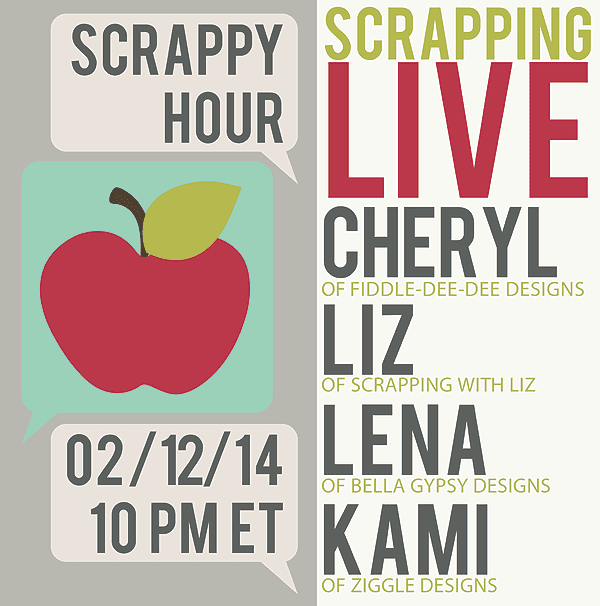 I'll be chatting and scrapping with Liz of Scrapping With Liz, Lena of Bella Gypsy Designs, and Kami of Ziggle Designs. We'll be sharing our favorite tips & tricks and scrapping layouts live, side-by-side, with full audio and video in the Adobe Connect Chat Room at Scrap Orchard. It's time to get some BIG HUGS!